Cozy Chicks: ALL DAY SOUP POT! THREE HEALTHY, LOW-CALORIE RECIPES. ALL DAY SOUP POT! THREE HEALTHY, LOW-CALORIE RECIPES. I hope everyone is enjoying all the wonderful summer vegetables that are sprouting in your garden (or a neighbor's garden). At times, the abundance of tomatoes, corn and zucchini can be a bit overwhelming. Here's a suggestion that works for me. 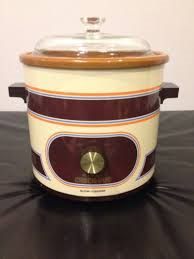 Get out the crockpot (mine is so elderly, it looks exactly like the one on the kitchen counter in the Americans. a TV show set in the 1980's). It doesn't have a timer, it doesn't have a liner you can take out, but I love it. Start with a basic broth. 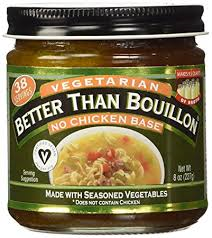 You can make your own, or use "Better than Bouillon," the low sodium variety. Make about a quart. 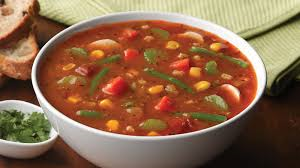 This will make a clear vegetable soup like the one pictured at the top of this blog. Add a generous selection of carrots, corn, zucchini, cabbage (you can use a package of coleslaw if you don't want to bother cutting up a cabbage). You can add potatoes, rutabaga, turnips, peas, whatever you have on hand. Now throw in a handful of fresh parsley and just let all the veggies get acquainted with each other. I let it simmer for hours, scooping out a cup from time to time when I want a snack. If you want a more "tomato based" soup, just add some tomato paste, a small can of crushed tomatoes, or even tomato juice or a little bit of spaghetti sauce. Fresh basil is a nice addition. 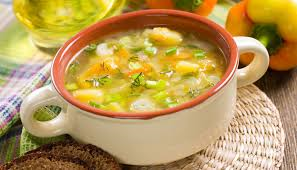 You can also add beans--any kind, especially white beans, black beans or kidney beans that will give some protein to the soup. (endamame is good, too). Some people prefer cream soup, and that's easy too. Simply pour a quart of chicken or veggie broth in the crockpot, add some pureed cooked carrots (cream of carrot soup, add a little curry powder) or pureed cooked broccoli (cream of broccoli soup) and an 8 ounce package of cream cheese. Whatever you like. You can also add all three ingredients to the blender (it will probably take two batches in the blender) and then pour it in the crockpot. If you want to use mixed veggies, instead of carrot or broccoli, here's what I do. I use one quart of chicken broth, one 8 package of cream cheese and two packages of cooked mixed vegetables from 2 packages of frozen vegetables. It will look like the photo below. And don't forget the parsley. (I used the boxes of mixed vegetables in the winter, but in the summer, I prefer to use fresh. I never measure the fresh veggies, but keep the "two boxes of frozen vegetables, cooked," in mind to gauge the amount.) 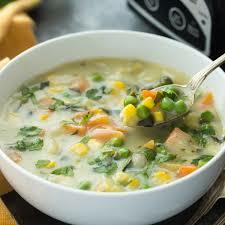 The cream soup version will look like the picture below. You'd be surprised at how often you'll stop and have a nourishing cup of soup throughout the day. It really fills you up and has relatively few calories. Add some home-made croutons, just chop up a baguette, toss with a little olive oil (or olive oil spray by Pam) and cook at 400 on a cookie sheet for 10 minutes. Delish and so much better than the ones you buy. You can buy stale French bread, sourdough bread, etc at the supermarket and that's perfect for croutons (and half price! ).